Definition at line 857 of file llagent.h. Definition at line 859 of file llagent.h. Definition at line 861 of file llagent.h. 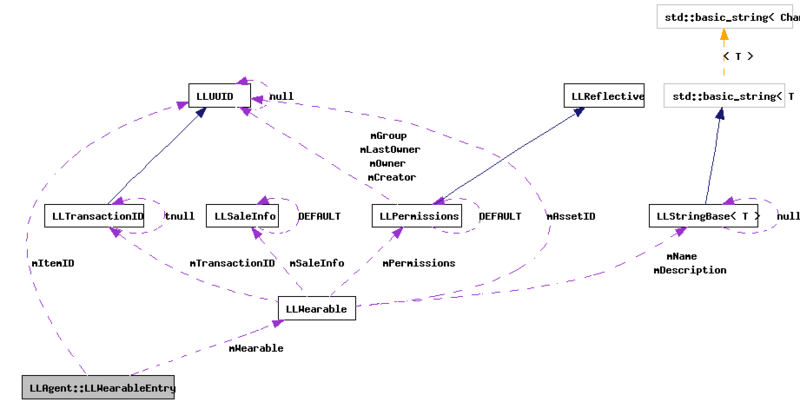 Referenced by LLAgent::addWearabletoAgentInventoryDone(), LLAgent::getWearableItem(), LLAgent::makeNewOutfitDone(), LLAgent::onInitialWearableAssetArrived(), LLAgent::processAgentInitialWearablesUpdate(), LLAgent::removeWearableFinal(), LLAgent::setWearable(), LLAgent::setWearableFinal(), and LLAgent::setWearableOutfit(). Definition at line 862 of file llagent.h. Referenced by LLAgent::addWearabletoAgentInventoryDone(), LLAgent::copyWearableToInventory(), LLAgent::createStandardWearables(), LLAgent::createStandardWearablesDone(), LLAgent::getWearable(), LLAgent::makeNewOutfit(), LLAgent::onInitialWearableAssetArrived(), LLAgent::recoverMissingWearable(), LLAgent::recoverMissingWearableDone(), LLAgent::removeWearable(), LLAgent::removeWearableFinal(), LLAgent::sendAgentWearablesUpdate(), LLAgent::setWearable(), LLAgent::setWearableFinal(), LLAgent::setWearableName(), and LLAgent::setWearableOutfit().